While Tembani Wildlife isn’t in the movie business, this is the business plan that it prescribes to. Ever since this operation started in 1996, the Mortons have had one goal in mind: to produce ever better quality animals, year on year. Tony and Richard Morton privately own Tembani Wildlife, a 3200 hectare private game reserve situated 25km from the town of Thabazimbi in the Limpopo Province. They are known in the industry for their honesty and integrity. Steve Jobs once said: “The only way to do great work, is to love what you do”. In this regard, the Mortons are on a winning wicket. 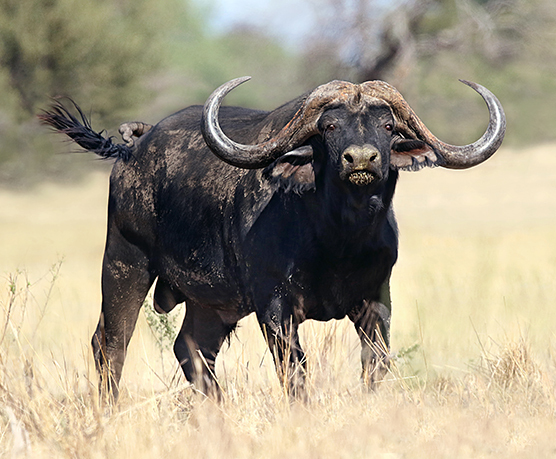 Tembani Wildlife is a breeding operation that focuses on genetics and ‘stud’ potential. The Mortons believe that superior stock results in animals of distinction and their farming practices reflect this. New genetics are continually being introduced and only the best mother stock is used. Their track record also reflects this belief. Just look at their young Buffalo bull, Juba, for example. He is Tembani’s first generation of Hercules sons bred on the farm. He’s only 5 years old and already 46.5” (SCI 128), with much room for growth. This is a testament to their winning formula. It’s not just Buffalo that are treated in this manner. Tembani Wildlife’s other main focus is Sable. With breeding bulls such as Deuce, Katavi, Variani, Luando and Big Easy, their Sable are also showing signs of exceptional breeding. Nyala, Bushbuck, Waterbuck, Golden Wildebeest, Kings Wildebeest, Golden Kings Wildebeest, Black Impala, Saddle-backed Impala, White Impala, Coffee Springbok, Golden and Red Gemsbok, Livingstone Eland and Kudu, are all bred with these practices in mind. While Tony and Richard are full time, hands on farmers, they also employ the expertise of Hanru Strydom (Wildlife Manager) and Marnus Moolman (Maintenance Manager). This team is passionate about the industry and firmly believe in operating with the high standards and integrity that their clients have come to expect from Tembani Wildlife. Prospective buyers are encouraged to visit Tembani Wildlife and see for themselves. As a proud member of Stud Game Breeders ®, Tembani is an integral part of the game industry, intent on empowerment, conservation and sustainability of game in our country. Tony and Richard look forward to welcoming you on Mount Joy Farm. Have you downloaded the latest SGB App? 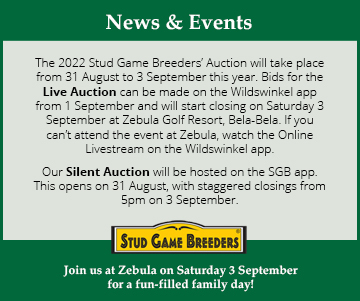 The SGB App features details of each animal on auction, including family trees. Register to bid on this year’s Silent Auction via the app. The SGB App can be easily downloaded on your smart phone or tablet on the App Store or Google Play. Astro has been recently introduced to one of our Tembani Buffalo herds. Self bred on Tembani, he is the son of cow No. 15, which was last measured at 33 5/8”. He promises to further enhance our breeding programme and we look forward seeing the results. Mount Joy, Dwaalboom Road, Thabazimbi. Tembani Wildlife is situated 30km from Thabazimbi (Limpopo) on Mount Joy Farm. The operation grew from a fallow cattle farm, bush encroached with no running water, electricity or infrastructure. An extensive bush clearing operation ensued and now the land is pristine bushveld.